Japan National Railways, abbreviated JNR, had provided a national railway network in Japan until it was devided and privatized to Japan Railways group in 1987. This is a gallery focusing to JNR. Kita-Moshiri Station on the Shinmei Line. Abolished in 1995. Minus 41.2 degree celsius, the coldest temperature in Japan was recorded nearby in 1978. Photo in Mar, 1994. Kami-Sunagawa Station on the Hakodate Mainline Kami-Sunagawa branch. This station was opened to handle coal, however fell into disuse due to closure of coal mine nearby, and finally abolished in 1994. Station building itself was preserved and exists as it was. Photo in Mar, 1994. Kaede Station on the Sekisho Line. It was a strange station, where a shuttle train came to a platform on sidling only once a day. Downgraded to signal station with no train stop and station building was scrapped in 2004. Photo in Mar, 1994. Itoizawa Station on the Nemuro Mainline. behind of the station is strech of moor, and the road in front is the National road route 44. Photo in Mar, 1994. Toono Station on the Kamaishi Line. Toono is famous as folklorish town, and tourist is welcomed by stone-made station building and monument in front. Photo in Jul, 1993. Ishinomaki Station on the Senseki and Ishinomaki Lines. 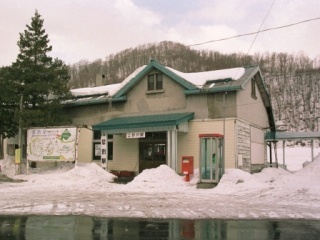 Ishinomaki Station had own station buildings on each lines separately but they were combined in 1994 and this station building on the Ishinomaki Line was replaced. Photo in Jan, 1990. Nikko Station on the Nikko line. Historical station building is suitable as a gataway of famous tourist city, however, the JR Nikko line is less competitive with the Tobu Nikko line. Only local trains are operated on the JR Nikko line. Photo in Jan, 1993. Akatsuka Station on the Joban Line. New Year Decoration can be seen. Ibaraki Kotsu Ibaraki Line was operated to this station until 1971, and this station building was replaced in 1999. This is my hometown. Photo in Jan, 1993. Narita Station on the Narita Line. Narita is famous for International Airport, but originally it has been a temple town of Shinsho-ji Temple. Station building is therefore inspirated by the temple. It is the next station of Narita Airport, but "Narita Express" does not stop at this station but bounds directly to Tokyo. Photo in Jan, 1990. Awa-Kamogawa on the Uchibo and the Sotobo Lines. These lines are terminated at this station, hence all trains depart from this station is up-trains. Popular destination of vaccation due to mild climate. The station building was replaced in 2006. Photo in Apr, 1990. Karuizawa Station on the Shin-Etsu Main Line. Yoko-Karu(Yokokawa/Karuizawa section) was a chokepoint of the Shin-Etsu Main Line, but it was already an old story by opening of Shinkansen in 1994. Yokokawa/Karuizawa section was abolished, while Karuizawa/Shinonoi section was transfered to Shinano Railway. Station building was also replaced at that time, but this building was preserved nearby and exists as it was. Photo in May, 1992.